So began a December, 2017 article describing the vital role of safety education and best practices in the commercial HVAC services industry today. And, while the majority of occupational injuries that occur annually are less serious in nature, according to the U.S. Department of Labor Bureau of Labor Statistics, fatal injuries among specialty trade contractors rose 6 percent to 631 in 2016, up from 595 in 2015. With these facts in mind, it’s vital for commercial HVAC companies to formalize and prioritize occupational safety for the good of their employees. We’re proud, at Tolin Mechanical, to have an industry-leading safety education and best practices program in place to make sure our technicians are working as safely as possible at all times. 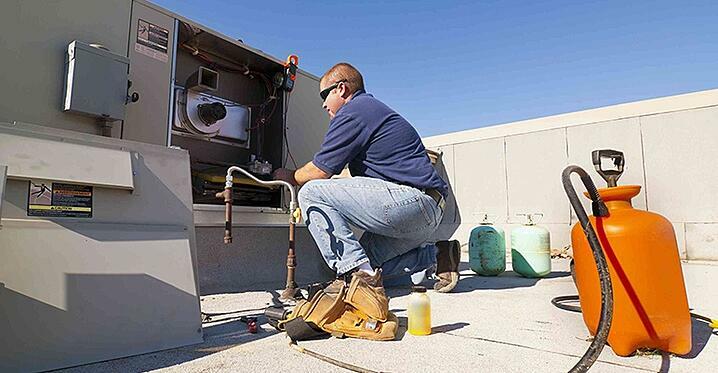 Taking the concept one step further, it’s also important to recognize that poorly maintained HVAC equipment can be more than just an inconvenience for tenants and employees living and working in the commercial facilities we service. So, we’re also proud to confirm that our dedication to HVAC safety extends beyond just our own employees and encompasses all those who interact with the mechanical systems we install and maintain. Our parent company Service Logic has become well known in the industry for an unparalleled commitment to occupational safety. As a result, we’ve been able to follow their lead and take advantage of valuable training resources and a true “safety culture” that permeates all the commercial HVAC companies in the Service Logic family. “Environmental Health and Safety training is not only a requirement; it's a significant part of our culture. From the first day of employment and jobsite-specific training to real-time safety bulletins and mandatory safety training sessions, our safety programs provide the most current information affecting our associates. At Tolin Mechanical, we take the safety of our technicians and our customers very seriously. That’s just one of the reasons we recommend contacting us the next time your commercial HVAC system needs planned maintenance or repair.